Noticed a few additions, one one omission. What I’m particularly looking for is a good reference for the interactiveGrid API. Hopefully they’ll add this soon. There is a reference for a “grid” widget but that is not the API for interactive grids. I notice there are APIs for actions and model which are relevant to interactive grids. Any other changes I’ve missed? 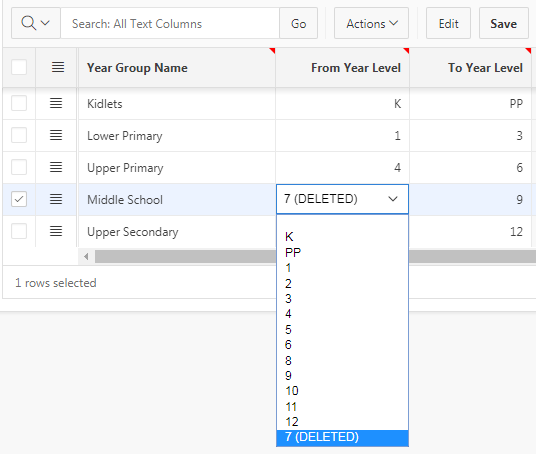 I had a column in an editable interactive grid based on a Select List, which takes valid values from a table that supports “soft delete” – i.e. records could be marked as “deleted” without affecting existing references to those deleted records. So now the select list shows the name, even if it has been deleted. However, once users start using this system and they delete some year levels, each select list will include all the deleted values, even if they will never be used again. We’d prefer to only include a deleted value IF it is currently used by the record being viewed; otherwise, we want to omit it from the list. This way, the select list will only include the deleted year level if the underlying item was already set to that deleted ID. But we are now using an Interactive Grid – there is no page item to refer to. Now, we need to make sure that “FROM_YEAR_LEVEL_ID” is available to the query, so we need to put it in the Items to Submit attribute. 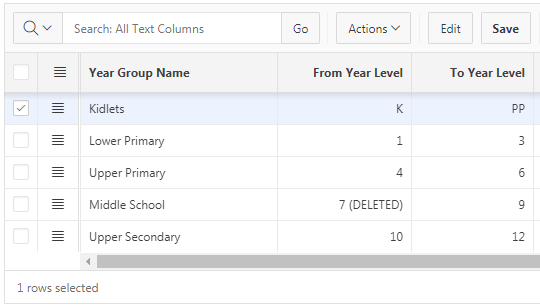 To make this attribute available, however, we must set Cascading LOV Parent Column(s) to something; I set it to the PK ID of the table, or some other column which doesn’t get changed by the user and isn’t actually referred to in the LOV Query. It should be noted that the design of the select list means that the user is allowed to save changes to the record while preserving the reference to the deleted year level. This is desired, in this case; if it wasn’t, however, I’d consider putting a validation on the page to stop the record being saved unless the user changes it to a valid value. P.S. Concerned parents should note that this example was just testing the ability to delete a record from a database, and I’d just like to make it totally clear that there are no plans by the department to eliminate year 7 from schools. Honest! 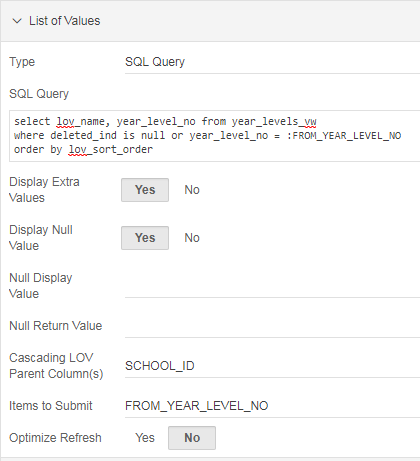 If the item is the child of a Cascading LOV, when the parent item is changed, APEX automatically clears out any value in the child before rendering the list of values – which means the column value submitted will be NULL – which means the “deleted” items disappear from the list immediately. This means the user will not be allowed to save the record with a reference to a deleted value from the list. Every Interactive Report has an optional set of “Link” attributes that allow you to specify the location where the user should be redirected if they click a link next to a record in the report. You can choose “Link to Custom Target” and use the Link Builder to easily specify the target application, page, item values to pass, and other attributes. What if the report combines different entities, and you need to direct the user to a different page depending on the type of entity? Or, if you need to direct the user to a different page with different attributes depending on the status of the record? One method is to generate the URL in the report query using apex_page.get_url (APEX 5+) or apex_util.prepare_url (APEX 4 or earlier), or (God forbid) you could generate the url yourself using string concatenation. Add a Request to the link to signal the page that a redirect has been requested. Here’s an example. My page 550 has an interactive report which combines TI records with TRQ records (both of which have a very similar structure). If the user clicks on a TI record they should be redirected to p510 with the corresponding TI_ID, and if they click on a TRQ record they should be redirected to p305 with the corresponding TRQ_ID. Notice that the page now redirects back to itself with the request set to “GOTO_TARGET”, along with the IDs required. My report query has been constructed so that every record will only have a TI_ID or a TRQ_ID, never both at the same time; so the link will ensure that only one of the P550_GOTO_xxx_ID values will be set. For a normal navigation to this report (e.g. from another page), the request should be blank (or some other value) so none of the Branches should be triggered. For a relatively simple scenario like this, I like the declarative approach. 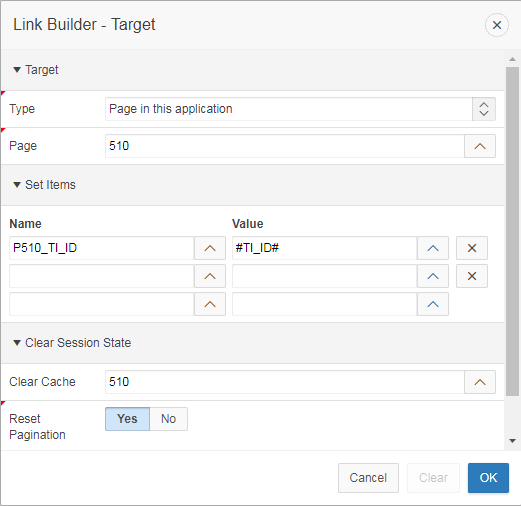 Each branch can take advantage of the full range of APEX features such as the link builder, security conditions, build options, etc. Note: this method works just as well for Classic report links as well. The thing to be mindful of is that the order of the branches, and the condition on each branch, must be carefully selected so that the correct branch is activated in each situation. I’ve shown a simple example which works because I have ensured that only one of the ID parameters is set at the same time. 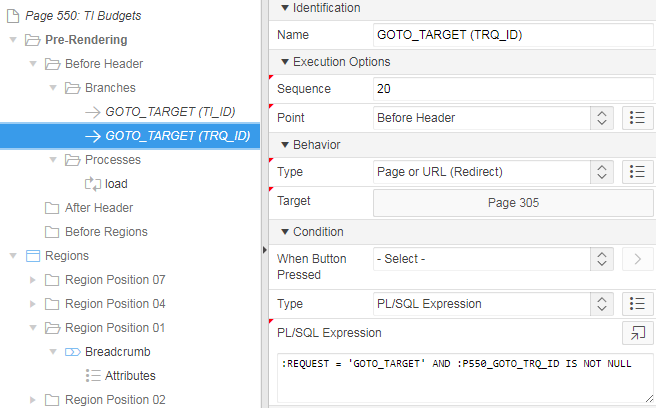 If a record has both IDs, the condition on the first branch “GOTO_TARGET (TI_ID)” will evaluate to True and it will be used, regardless of what GOTO_TRQ_ID was set to. If there were numerous potential destination pages, with a large number of parameters to pass, I might choose the apex_page.get_url method instead. The users complained that they currently have to click each link to drill down to the detail records to find and fix any errors; they wanted the screen to indicate which detail records were already fine and which ones needed attention. Since screen real-estate is limited here, I wanted to indicate the problems by showing a red edit link instead of the default greyscale one; since this application is using an old theme I didn’t feel like converting it to use Font Awesome (not yet, at least) and neither did I want to create a whole new image and upload it. Instead, I tried a CSS trick to convert the greyscale image to a red shade. WARNING: Unfortunately this trick does NOT work in IE (tested in IE11). Blast. 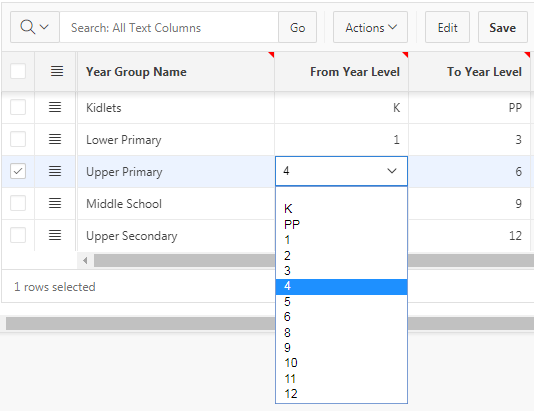 I set the new column type to Hidden Column. What this does is if there is an error for a particular record, the class "btnerr" is added to the img tag. Rows with no error will simply have class="" which does nothing. But, as I noted earlier, this solution does not work in IE, so that’s a big fail. NOTE: if this application was using the Universal Theme I would simply apply a simple font color style to the icon since it would be using a font instead of an image icon. Updated 10/10/2017 now that APEX 5.1 has been out for a while. 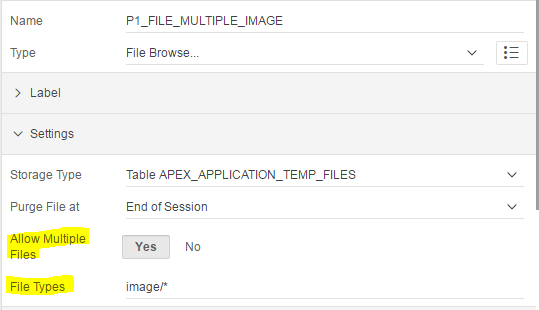 The standard File Upload item type is getting a nice little upgrade in Apex 5.1. By simply changing attributes on the item, you can allow users to select multiple files (from a single directory) at the same time. In addition, you can now restrict the type of file they may choose, according to the MIME type of the file, e.g. image/jpg. This file type restriction can use a wildcard, e.g. image/*, and can have multiple patterns separated by commas, e.g. image/png,application/pdf. You can play with a simple demo here: https://apex.oracle.com/pls/apex/f?p=UPLOAD_DEMO&c=JK64 . 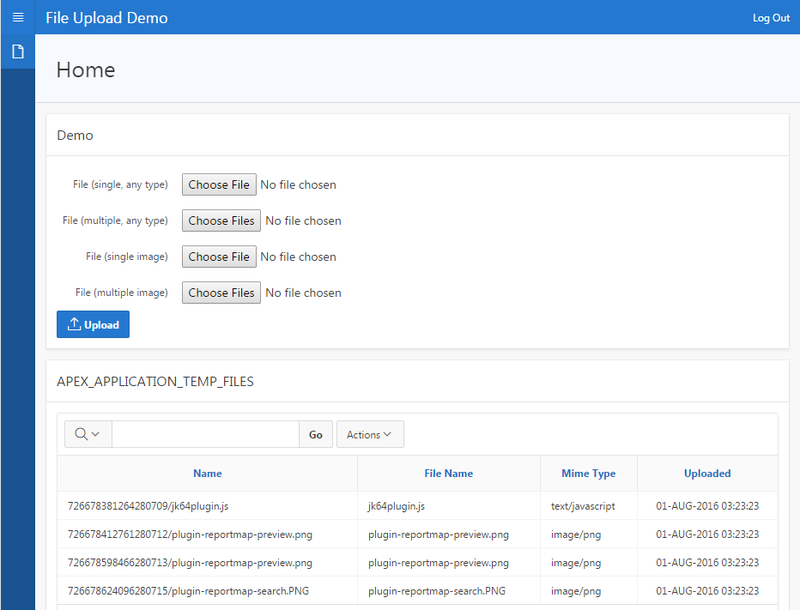 (UPDATE 10/10/2017: recreated demo on apex.oracle.com) If you want to install the demo app yourself, you may copy it from here. If you want to support drag-and-drop, image copy&paste, load large files asynchronously, or restrict the maximum file size that may be uploaded, you will probably want to consider a plugin instead, like Daniel Hochleitner’s DropZone. DISCLAIMER: this article is based on Early Adopter 1. I’ve finally got back to looking at my reference TAPI APEX application. I’ve greatly simplified it (e.g. removed the dependency on Logger, much as I wanted to keep it) and included one dependency (CSV_UTIL_PKG) to make it much simpler to install and try. The notice about compilation errors still applies: it is provided for information/entertainment purposes only and is not intended to be a fully working system. The online demo for APEX 5.0 has been updated accordingly. I next turned my attention to APEX 5.1 Early Adopter, in which the most exciting feature is the all-new Interactive Grid which may replace IRs and tabular forms. I have installed my reference TAPI APEX application, everything still works fine without changes. (1) APEX$ROW_STATUS for inserted rows is ‘I’ instead of ‘C’; also, it is set to ‘D’ (unlike under tabular forms, where it isn’t set for deleted rows). (2) After inserting a new record, the session state for the Primary Key column(s) must be set if the insert might have set them – including if the “Primary Key” in the region is ROWID. Otherwise, Apex 5.1 raises No Data Found when it tries to retrieve the new row. The steps needed to convert a Tabular Form based on my APEX API / TAPI system are relatively straightforward, and only needed a small change to my APEX API. If your query already included ROWID, you will need to remove this (as the IG includes the ROWID automatically). Also, if the table has a Surrogate Key, delete the generated ROWID column. Otherwise, leave it (it will be treated as the Primary Key by both the Interactive Grid as well as the TAPI). Set any columns Type = “Hidden” where appropriate (e.g. for Surrogate Key columns and VERSION_ID). 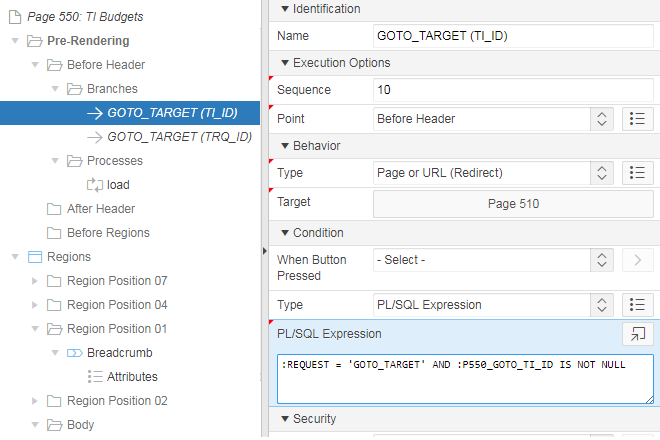 PL/SQL = (copy the suggested code from the generated Apex API package) e.g. The Interactive Grid allows the developer to choose the type of Lost Update protection (Row Values or Row Version Column). The help text for this attribute should be required reading for any database developer. In my case, I might choose to turn this off (by setting Prevent Lost Updates = “No” in the Save Interactive Grid Data process) since my TAPI already does this; in my testing, however, it didn’t hurt to include it. I found it interesting that the converted Interactive Grid includes some extra columns automatically: APEX$ROW_SELECTOR (Type = Row Selector), APEX$ROW_ACTION (Type = Actions Menu), and ROWID. These give greater control over what gets included, and you can delete these if they are not required. Another little gem is the new Column attribute Heading > Alternative Label: “Enter the alternative label to use in dialogs and in the Single Row View. 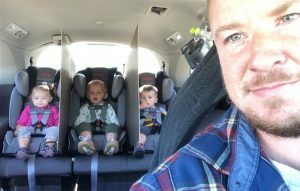 Use an alternative label when the heading contains extra formatting, such as HTML tags, which do not display properly.”. I’ve checked in an export of this application to the bitbucket repository (f9674_ea1.sql).